Undoubtedly, you’ve been seeing the recent images of Comet ISON now that it is approaching its close encounter with the Sun on November 28. ISON is currently visible to space telescopes like the Hubble and amateur astronomers with larger telescopes. But you might be wondering why many images show the comet with a green-ish “teal” or blue-green color. Amateur Astronomer Chris Schur has put together this great graphic which provides information on the spectra of what elements are present in the comet’s coma. For the conspiracy theorists out there, the green color is actually a good omen, and lots of comets display this color. The green color is a sign the comet is getting more active as gets closer to the Sun – meaning it is now putting on a good show for astronomers, and if it can continue to hold itself together, it might become one of the brightest comets in the past several years. 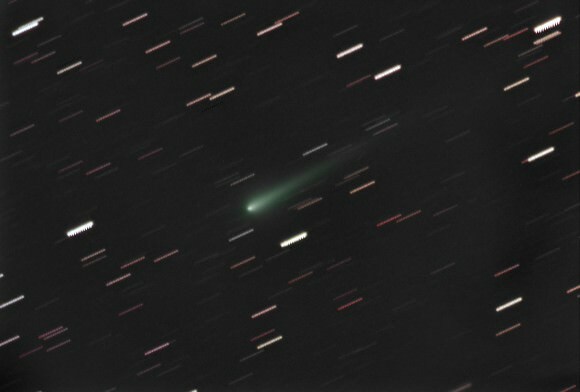 Comet ISON on October 4, 2013 as seen over Arizona, viewed with a 12.5″ telescope, over an hour exposure time. Credit and copyright: Chris Schur. Both are normally colorless gases that fluoresce a green color when excited by energetic ultraviolet light in sunlight. And if those poisonous gasses sound dangerous, don’t worry. They are spread out in space much too thinly to touch us here on Earth. So don’t fall prey to fear mongers who are out to bilk the masses – like people did in 1910 when Comet Halley made a return to the skies and swindlers pitched their ‘gas masks’ and special ‘comet pills’ for protection. And of course, nothing happened. Your readers may appreciate knowing why comets can appear this color. The background image is the shot I took with my 12.5″ and an ST10xme CCD camera for 20 minutes in mid-October. A pale coloration of the front of the coma is seen. To the lower left is a shot with the same instrument but with a 100 lpmm (line pair per millimeter) diffraction grating in front of the CCD chip to break out the spectra of the objects in the entire field. Here ISON is faintly seen to the left of center, and the first order spectra a band to its right. But the real answer comes when we use the software called Rspec to analyze this band of light. The result is on the lower right. Normally reflected sunlight is rather flat and bland, and mostly that is what ISON is right now, reflected from dust. But labeled are two humps in the blue and green parts of the spectrum labeled “C2” for a carbon molecule. This blue/green emission pair is what gives ISON the color. 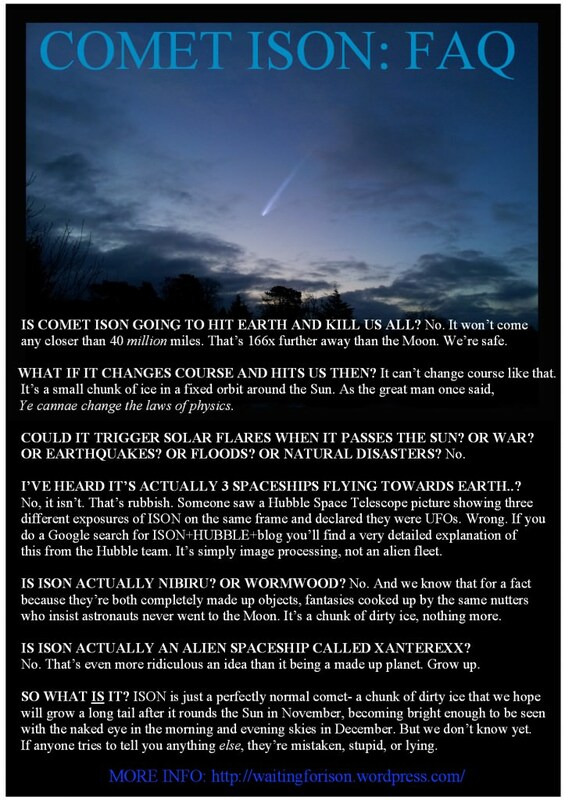 And for those who insist there is something nefarious about Comet ISON, take a look at this FAQ from our friend Stuart Atkinson, who hosts the great site Waiting for ISON. He addresses the many conspiracy theories that are out there regarding this comet. Comet Ison will be extremely visible to the naked eye, long before it even goes near the sun, it will be 10x brighter then the moon and might even blind children who look directly at it. 40 million miles from the sun? More like a million miles from the sun… Stuart Atkinson is either mistaken, stupid or lying. Stuart was referring to the Earth, not the Sun! This “reassurance” is nothing more than government propaganda to lull the people to sleep so they don’t panic and crash the stock market until the elites of the elites do it first then collapse the economy before Earth goes through the comet trail debris. I thought the green color was for when it passes by earth on Christmas day! Um…Sorry to be a pain here but can ANYONE…..Anyone at all…. show me the proof that says Comets are made of ice when not one single time has water ever been found on or even near one? Gas Dynamics and Kinetics in the Cometary Coma: Theory and Observations. Ty. However, this is theory. None of the practical efforts made so far have revealed ANY ice at all. Have they? Secondly, astronomical spectroscopy of comets have revealed the presence of many organic chemicals, as well as ?H2O. Thirdly, the Giotto spacecraft (in 1986) observed 80% water ejected by Halley’s comet; the Deep Impact spacecraft (in 2005) observed the presence of water; the Stardust spacecraft (in 2006) returned a sample from the coma of comet Wild 2, which showed the presence of water. Finally, the Rosetta spacecraft is currently on its way to rendezvous with the comet 67P/Churyumov–Gerasimenko, where it will deposit a lander (in Nov. 2014) while in orbit around the comet; the lander will determine the characteristics and chemical composition of the comet’s nucleus.